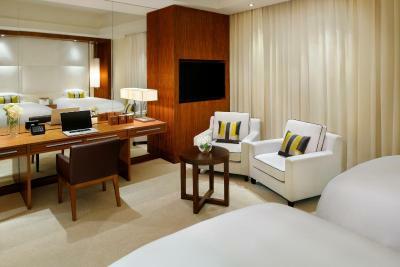 Lock in a great price for JW Marriott Marquis Hotel Dubai – rated 8.8 by recent guests! Excellent in every aspect. The staff, the rooms, the facilities, the food, the view. This is my 4th stay at this hotel and it keeps getting better and better! The hotel's shuttle service to the Dubai Mall is simply a perfect add-on. The hotel’s amenities and restaurant selection is really good. The customer need prove or bill when paid for add extra night after staying in hotel . Staff treatment from the front door tell you get back to the front door checking out , it was nice experience we have memory’s over here in this place . THank you JW Marriott Team & Leaders for the good well organized work you had all done to make us 😊. The employees are very cordial and very friendly and the location is very good and I enjoyed the walk around the property. Very friendly, helpful and kind staff, they did everything to make me and my family happy, customer care is something they are really excellent at, well done and thank you JW Marriot Marquis. JW Marriott Marquis Hotel Dubai This rating is a reflection of how the property compares to the industry standard when it comes to price, facilities and services available. It's based on a self-evaluation by the property. Use this rating to help choose your stay! One of our top picks in Dubai.Spread across two iconic towers, the spectacular JW Marriott Marquis Hotel features an enticing array of 14 award-winning restaurants, bars and lounges and the sublime Saray Spa and Health Club. For leisure travelers, the hotel is ideally placed between Dubai Mall and Mall of the Emirates, next to Business Bay Metro Station and enjoys a spectacular location directly beside the new Dubai Water Canal extension. The JW Marriott Marquis Dubai offers free WiFi and an outdoor swimming pool. 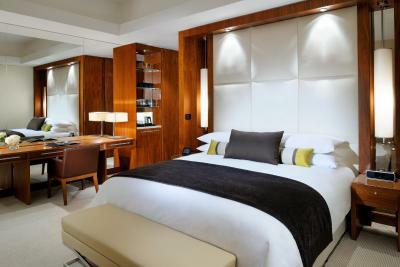 All 1,608 luxurious guest rooms and accommodations are elegantly designed and feature a contemporary décor. Each of its spacious rooms includes flat-screen TV, floor-to-ceiling windows and a desk. 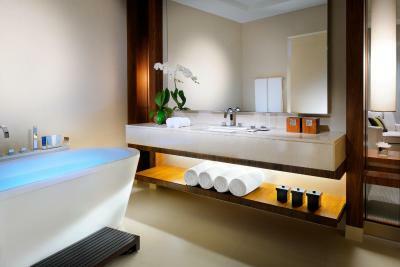 The bathroom comes with a soaking tub and a bathrobe. 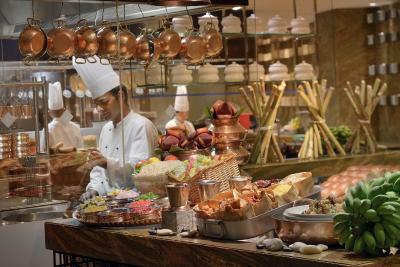 Guests can enjoy a vast array of local and international buffet. 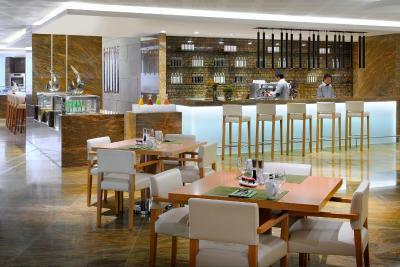 For an international experience, step into the award-winning Kitchen 6 restaurant, where six interactive cooking stations come to life creating an extraordinary selection of world cuisines. Bridgewater Tavern is an edgy sports bar with a gastrodive feel, serving nouveau drinking food. Blurring the lines between bar and restaurant - Bridgewater Tavern is at the forefront of redefining sports bar culture, creating an ideal place for serious food lovers and thrill-seekers. 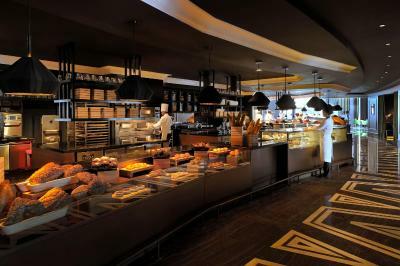 International buffets are available at the renowned KITCHEN6. 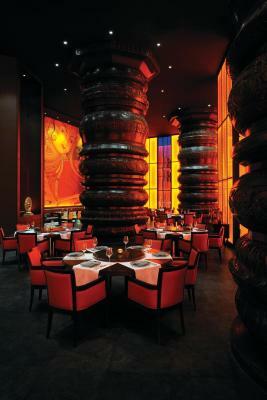 Celebrity chef Atul Kochhar prepares modern Indian cuisine at Rang Mahal. 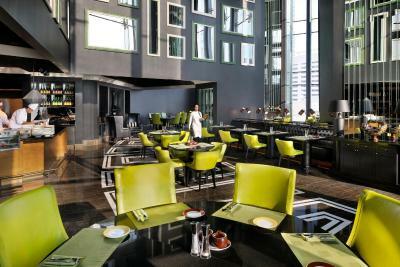 Guests can marvel at Dubai Skyline while enjoying a cocktail at the Vault Bar which is located at the top floor. 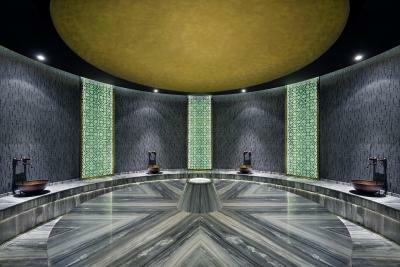 Guests can have a dip in the outdoor swimming pool or a relaxing hammam experience at Saray Spa. Local excursions can be arranged by the hotel’s tour desk. Valet parking is also available. Wild Wadi Water Park can be reached by car in 20 minutes. Emirates Golf Club is 11 mi away. 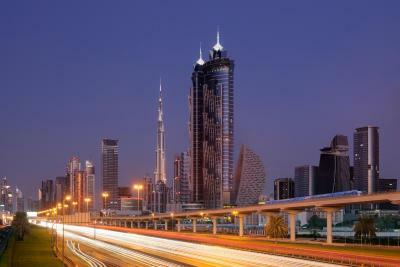 JW Marriott Marquis is a 25-minute drive from Dubai International Airport. 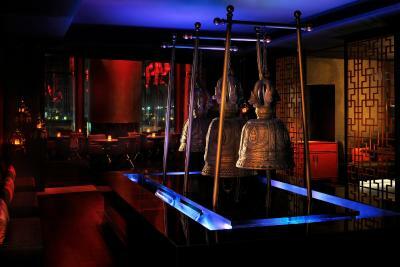 The property offers a free shuttle bus to Dubai Mall. 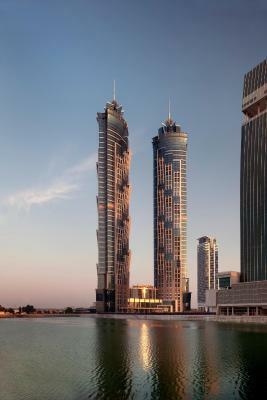 When would you like to stay at JW Marriott Marquis Hotel Dubai? This luxurious air-conditioned room features a contemporary design. It is furnished with carpeted floors and includes a flat-screen TV, a wardrobe and an iPod docking station. The marble-floor bathroom is fitted with a bath and a shower and offers free toiletries. 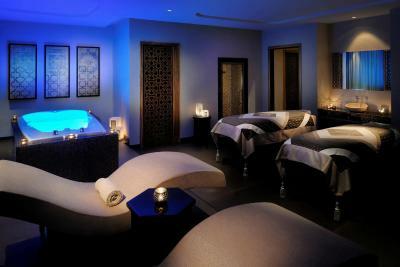 This spacious, luxurious, air-conditioned room features a contemporary design. It is furnished with carpeted floors and includes a flat-screen TV, a wardrobe and an iPod docking station. The marble-floor bathroom is fitted with a bath and a shower and offers free toiletries. Kindly note that breakfast and Food & Beverage will be served in the Executive Lounge for guests that are staying in the Executive rooms and Executive Suites. Guests in this room is offered complimentary WiFi. 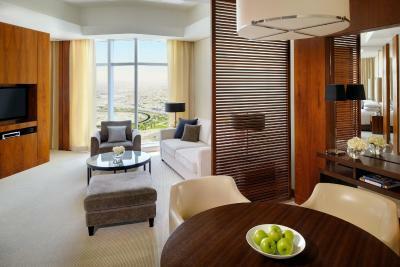 This extra spacious, luxurious, air-conditioned suite features a contemporary design. It is furnished with carpeted floors and includes a flat-screen TV, a wardrobe and an iPod docking station. The suite is also equipped with a mini-bar and a fridge. The marble-floor bathroom is fitted with a bath and a shower and offers free toiletries. Offering a sea view, this luxurious air-conditioned room features a contemporary design. It is furnished with carpeted floors and includes a flat-screen TV, a wardrobe and an iPod docking station. The marble-floor bathroom is fitted with a bath and a shower and offers free toiletries. This air-conditioned corner suite offers a separate living room. It is furnished with carpeted floors and includes a flat-screen TV, a wardrobe and an iPod docking station. 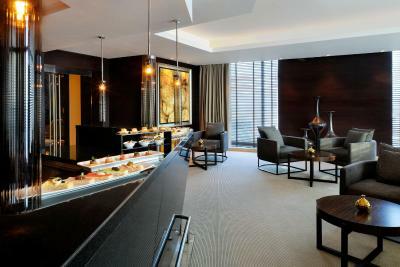 The suite is also equipped with a mini-bar and a fridge. The marble-floor bathroom is fitted with a bath and a shower and offers free toiletries. This twin room has a iPod dock, bathrobe and mini-bar. This twin room features a flat-screen TV, iPod dock and air conditioning. 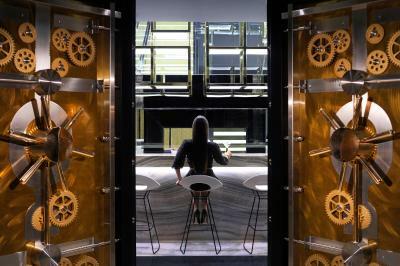 A new 5-star destination in Dubai, the JW Marriott Marquis Hotel Dubai is a striking addition to an already spectacular city. 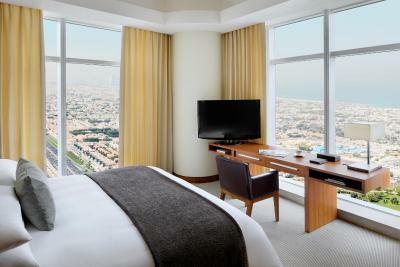 As the world's tallest hotel, we boast over 1,600 guest rooms and suites spread out across two towers. 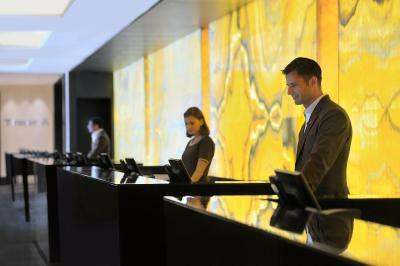 House Rules JW Marriott Marquis Hotel Dubai takes special requests – add in the next step! Any additional children or adults are charged AED 180 per night for extra beds. JW Marriott Marquis Hotel Dubai accepts these cards and reserves the right to temporarily hold an amount prior to arrival. No shattaf in the toilet. I absolutely loved everything about this hotel. Awesome experience and food was amazing. Definitely coming back !